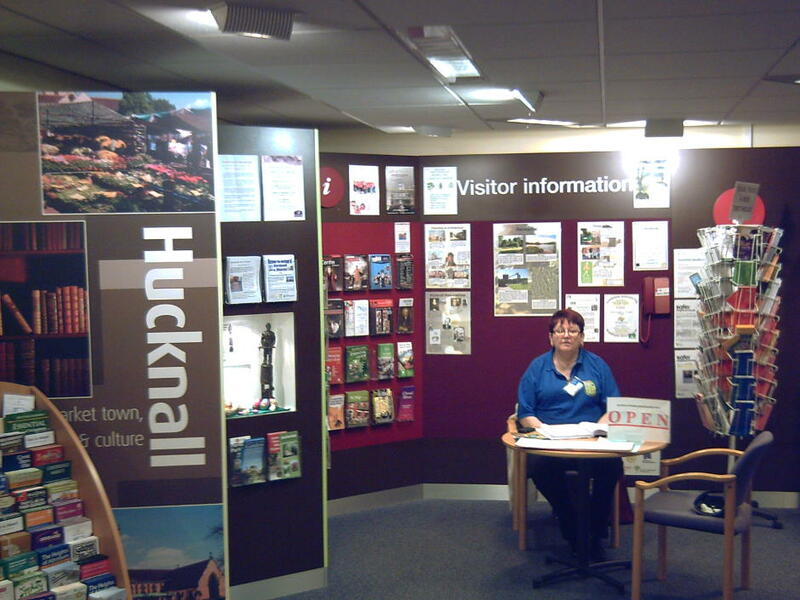 The Hucknall Visitor Information Point was established in the Spring of 2004 and fully refurbished and updated in the Spring of 2006 in order to help visitors to the town find information about Hucknall and its surrounding villages. Our hours of business are 10:00am to 2:00pm Monday, Tuesday, Thursday, and Friday, and 10:00 to 12 noon on Saturday. It is a unique venture in that it is a partnership between the Library service, the Hucknall Tourism and Regeneration Group, Experience Nottinghamshire and Ashfield District Council. The library provide the venue and backup, the Council provide support and furnishings but the main input comes from the tourism group who provide a number of volunteers to staff the point and order relevant material. Since the staff are local people they offer both enthusiasm for the area and a good local knowledge. Being based in the library it is an ideal point for further information; such as local history, access to computers and information about local events and organisations and much more. Since the Information Point is staffed by enthusiastic local residents they offer a first hand positive experience of the life and history of the town. They are backed up by the library staff who can guide the visitor to find answers to the more complex questions that may arise. This makes the centre not only a first point of call for a tourist but also one for those who are particularly interested in the heritage of the town. The Tourism Group are always looking for additional volunteers to spend a couple hours each week talking to our visitors. This is an ideal opportunity to be of service to your town by helping those who come to visit us. If you would like to offer a few hours of your time, to support this venture, please contact us or visit us at the library.